Airedales do not respond well to heavy-handed training methods. Training efforts are most successful if they are based on praise rather than punishment. Your Airedale wants to work with you not for you. Your training methods will have to take this attitude into account. 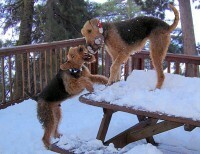 Some breeds will joyfully do the same task repeatedly, not Airedales! Drills and repetitive exercises are met with less than an enthusiastic response. Click on the "Airedale Pamphlet" below to get a pdf file of the discussion above on questions about if an Airedale is right for you in a tri-fold format.